What happens when the fashion writing wizards at ModCloth team up with 826 Valencia’s workshops program? 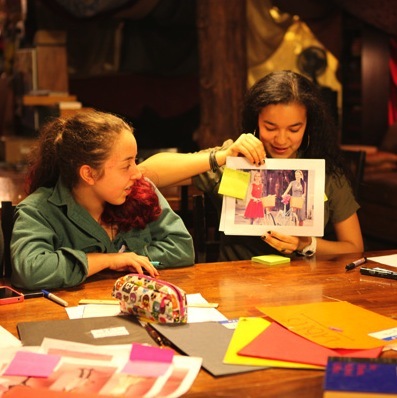 Introducing Sew Haute, a blog written and produced by the fashion-forward teens who attended our Catwalk or Run fashion writing workshop. This class, taught by Laura Vrcek, fashion writer for the vintage-inspired indie retailer ModCloth.com, led students through the range of fashion writing available today–from writing copy to fashion journalism to personal street style blogs. Vrcek also introduced these stylin’ students to the creative directors, stylists, and writers behind ModCloth.com. To celebrate our dapper disciples’ hard work and cement them as bona fide fashion writers, we celebrated the launch of their collective blog, Sew Haute, with a sparkling cider soiree. We hope you’ll support these young fashionistas by checking out Sew Haute and sharing the blog with your friends—who knows, maybe they’ll be inspired to start fashion blogs of their own!